waiting to make their biggest moves during the offseason (if then). ability to make trades. His track record so far has been pretty disappointing. his career, going 2-0 with a 1.54 ERA (small sample size, I know). they can’t even buy runs at this point). not to participate. Joe Mauer hasn’t been asked, but Gardy thinks he would win it if he were. actually) who doesn’t give me heartburn. Yep, watching a bunch of hockey players take BP afterwards was about the most exciting part of this game. Well, it was kind of depressing too, since they all hit the ball farther than Justin Morneau (somebody give Cal Clutterbuck a contract). Scott Baker got roughed up in his debut, giving up six runs on five hits in four innings. Baker struggled with his command against left-handed hitters and gave up four homers against righties. His fastball, which usually runs in on right-handed hitters, had no movement on it whatsoever and the Blue Jays took advantage of all of the pitches he left up over the plate. I have mentioned before that Baker is a flyball pitcher and as such he tends to give up a lot of home runs (at a rate of about once per nine innings pitched), but that the damage is usually limited to solo homers since he doesn’t put a lot of runners on. It doesn’t sound his struggles had anything to do with lingering stiffness in his shoulder, at least according to Baker, anyway. It was probably just terrible luck for a pitcher who tends to give up the long ball (like Baker) to make his debut against a hot-hitting team like Toronto. The offense, meanwhile, struggled to do much of anything against Scott Richmond. And I was going to be more upset about this, but I just heard the greatest news ever: Doug Risebrough has been fired as GM of the Wild. That’s right, owner Craig Leipold has decided to go in an entirely different direction now that Jacques Lemaire has stepped down. I’m not going to speculate as to what led to the decision (although there are many, many, many, many examples of Risebrough’s incompetence over the years), I’m just glad it’s done. I was just lamenting how the season is over and the franchise is in shambles, but with a complete restructuring of the front office there is now some hope that things might get better. It is truly an exciting time to be a Wild fan. The Twins have scored a total of 26 runs in their past seven games, which certainly isn’t bad. Unfortunately, the offense has also been producing runs rather inconsistently. In the three wins so far this season, the hitters have driven in a combined 24 runs. In the four losses, however, the team has only scored two runs and has been shut out twice. That’s right. The offense has been completely shut out twice already this season. That is certainly something to be concerned about. However, I do think that the offense will start to produce more consistently when Joe Mauer returns to the lineup. Actually, that they’ve been able to score this many runs without him is a very good sign. The pitching staff has a 5.16 ERA and a WHIP of 1.31. Which is obviously not good. However, I think the starting pitching will get better. The entire pitching staff seems to be suffering from a bout of wildness, which is unusual for this particular group (last year they gave up a league-best 54 walks, so control isn’t generally an issue). The pitching staff has given up 19 walks so far this year, compared to the mere 37 strikeouts they have recorded. And really, nearly half of these walks came from the series in Chicago, when Francisco Liriano struggled to find the plate in the fifth (and walked four batters) and knuckleballer R.A. Dickey also walked four during his start on Friday. Most encouraging, however, is that the starters have looked really good when their stuff is on, and that most of the damage has been limited to a few bad innings. I am a little concerned that the bullpen is struggling to pitch scoreless innings, though. So far they have only had one save opportunity, Wednesday night against Seattle, and they managed to not screw it up. 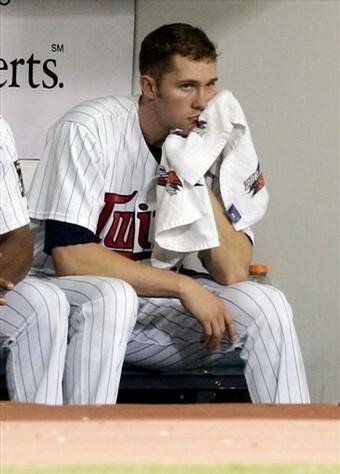 However, in every single one of the Twins’ losses this year, and even in their blowout victory against the White Sox on Friday, the bullpen has given up at least one run and sometimes more. While it didn’t matter much in games like the one in Chicago on Saturday, when the Twins were down by five runs and couldn’t solve Bartolo Colon, it does matter in close games. It’s one thing to be down by a pair of runs in the later innings, but quite another to be down by four or five. Especially for an offense that has been struggling to produce consistently. Come to think of it, maybe this is how they both got injured in the first place. There’s still no news. as of 9pm tonight. I’m starting to really get worried. The Star Tribune is reporting that the doctors and the FO are conferring over what to do, so it doesn’t look good. Oh Lordy, I’ve already suffered enough disappointment with teams from Minnesota this year. I certainly don’t need any more. Apparently there isn’t anything wrong with Little Nicky’s elbow. Team doctors re-examined the X-rays he had taken in Toronto, and determined that nothing is broken. Most of the swelling has subsided in the joint, and is tentatively scheduled to start in today’s game against the Yankees. Little Nicky has gotten off to a very slow start this spring, with a .100/.100/.100 in ten plate appearances, and wasn’t very effective for Team Italy in the WBC, either (he was 0-for-12). Normally I wouldn’t be all that concerned about a guy’s performance in spring training games, but Punto gives me several reasons to worry. First of all, he’s thirty-one years old and probably reached his peak offensively last season (it was pretty much his career year, after all). As I have mentioned before, his bat has a tendency to get cold whenever he’s guaranteed a starting job, and he is now the everyday SS after signing that two-year deal in December. Obviously a lineup with Punto and without Mauer isn’t going to make opposing pitchers lose any sleep. What happened to Team USA? Some of these WBC games have been very close nail-biters between some of the best pitchers in the world. This, however, was not one of them. The Puerto Ricans slaughtered the USA 11-1 in seven innings, after which the mercy rule was invoked and everyone was put out of their misery (including those of us who were watching this crap). So what went so horribly wrong? Well, apparently the American pitchers (Jake Peavy in particular) forgot how to record outs. And the American hitters forgot how to drive in runs, or even get on base. I guess the coaching was really bad, too. I mean, really, if your pitcher gives up six runs in two innings, shouldn’t you pull the guy? The worst part about this whole thing is that Jake Peavy was shown up by Javier Vazquez. Who says Javy isn’t a big-game pitcher? The United States now has the same record in round two as the Netherlands. Like their Dutch counterparts, the next game is do-or-die for the American team. Unlike the Dutch, however, the US was heavily favored to win this thing. Team Hollandaise wasn’t expected to win a single game, let alone advance to the next round, so what they have accomplished so far is pretty remarkable. Even if it is the end of the line. Another early exit from the WBC would be an embarrassment for the US team, though, and might kill any chance that the American public will actually start taking the tournament seriously. Oh, they lost another must-win game at Dallas last night, but at least they showed some life for a change. Yes, they made a couple of bad plays that ended up costing them the game, but at least it was only two this time. For the most part they actually skated well. And they played with the sort of desperation a team that is, well, desperate to make the playoffs really needs. The Stars, who are also fighting for the last playoff spot, were just a little more desperate this time. GM Doug Risebrough hasn’t been too happy with the team’s play as of late, either, and even said so yesterday. Of course, DR is the one who chose to do nothing at the trade deadline even though the team was clearly struggling. And he also let key contributors such as Brian Rolston walk without finding much in terms of a replacement. He was the one who decided to give jobs to unproven rookies like Colton Gillies (and guys who might as well be rookies like James Sheppard) who should really be in juniors right now and not getting their confidence shattered in the NHL. And he (probably) botched contract talks with the team’s leading scorer. So, you know, the players aren’t entirely to blame for this mess. Despite dropping three straight OT games (apparently our boys don’t realize that an OT loss is still a loss), the Wild are not completely out of the Western Conference playoff picture. They are currently one point out of the eighth, and final spot (not that they really deserve a playoff berth, but that’s a different story). They have to play the second of back-to-back road games in St. Louis tonight. Ordinarily I would be glad to see the Blues on the schedule, since the Wild would most certainly win this game in the past. However, given the awful effort the team has put forth lately, I wouldn’t be terribly surprised if they lost. Again. Hey, at least somebody can win a game! The Wolves beat the Bobcats 108-100 last night, which marks their 20th win of the season. Of course, they’re still 26 games below .500 and will most certainly finish with their fourth straight losing record, but at least they’ll probably surpass last year’s total of 22 wins. This win was just a little more satisfying because the Wolves may have just killed Charlotte’s playoff hopes. Way to go, guys! If you aren’t going to make the playoffs, at least you can take someone else down with you. Well, today’s game against Florida started out really good. The offense finally started coming to life, and Kevin Slowey looked really sharp out on the mound. The Twins had jumped out to an early 5-0 lead, and the relief pitchers were effectively shutting down the Marlins’ offense. Until Jose Mijares came in to pitch the seventh, that is. Mijares gave up four earned runs on three hits and recorded only one out. He was yanked in favor of knuckleballer R. A. Dickey, who quickly mopped up the mess (before getting into trouble himself in the eighth). What was once a five-run lead became a mere one-run lead. Then it became a four run deficit due to some defensive miscues by, well, a bunch of guys who have no chance at making the team anyway so I guess it doesn’t matter that much. 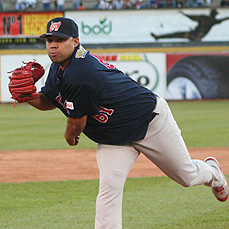 Mijares was very impressive with his few appearances with the Twins when he was called up in September. The hard-throwing lefty gave up one earned run on three hits in ten relief appearances last year, posting an ERA+ of 465. His stuff was absolutely filthy, and he wasn’t afraid to challenge big-league hitters even if he was behind in the count. Mijares will probably be a dominant set-up man, and could perhaps take over for Joe Nathan at some point. However, he needs a lot more work. He showed up grossly overweight at camp this year, after the coaching staff told him he needed to get in shape during the offseason. Although Mijares was very good in his first appearance, clearly his lack of physical fitness is affecting his effectiveness. He’s labored in his past couple of appearances, and has just generally looked like he was out of breath out there on the mound. It wouldn’t be so bad, but Mijares refuses to take responsibility for his lack of physical conditioning and instead blames a sore ankle for his poor performance (um, a sore ankle wouldn’t cause you to huff and puff after throwing a single pitch). It seems as though Mijares thought he was a lock to make the active roster out of Spring Training (despite Bill Smith’s assertion to the contrary) and simply failed to put forth the effort necessary to compete for a job. The best thing for the young lefty at this point would be to send him to AAA for more seasoning. He certainly can’t be relied upon to pitch out of the bullpen in such poor shape, and he really needs to learn to listen to the coaching staff. Francisco Liriano wasn’t that sharp against the Reds yesterday, but he was still effective enough. His one bad mistake was a solo homer to Jonny Gomes, but that was the only run he allowed in 3 1/3 innings of work. Frankie struggled to locate his fastball and his changeup wasn’t terribly impressive, but he still only gave up three hits and struck out five batters. Although he isn’t exactly the same pitcher he was before his Tommy-John surgery in 2006, Liriano is on track to become one of the top pitchers in the American League. While it’s a bit premature to say he will be a legitimate Cy Young contender, I do think that Frankie will at least challenge Scott Baker for the top spot in the rotation. Jesse Crain looked really good on the mound yesterday, too. Crain has been having a really good spring, and his stuff was electric when he pitched for team Canada in the WBC. This is very good news, considering how awful the bullpen was last season. The team is still in need of a set-up man, and Crain is making a very good case for himself to earn that job. I was going to complain about the lack of offensive production from the regulars yesterday, but Micah Owings and Edison Volquez are both some of the best young pitchers in the National League, so I guess I won’t whine too much. Besides, they more than made up for it in today’s game against the Marlins. Too bad the defense couldn’t make it stick.